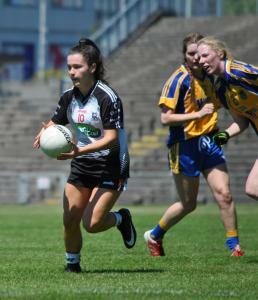 Well done to Claire Dunne on making her competitive Intermediate inter county debut when donning the “Black and White” against Roscommon in the Connacht Final in McHale Park on Sunday week last. For somebody so young and only in the panel a matter of weeks she acquitted herself very well and visibly grew in confidence as the game progressed. She has been one of the leading players in the county at underage level in recent years and it is great to see her now bringing that form into adult football. She was one of two St. Farnan’s players in the squad on the day, Leah Kelly having just recently re-joined the group after taking time out to concentrate on her Leaving Certificate studies. Unfortunately, victory on the day went to the Rossies thus depriving the Yeats county of a three-in-a row of provincial titles in the grade, but the new look Sligo side will have learned a lot from the experience which no doubt will stand them in good stead in years to come. The U-14’s continue on their winning ways and have qualified for the final of the Group 3 League. The side finished the Group stage of the competition in a three way tie for second place along with Curry and Geevagh thus necessitating playoffs to decide which team would advance to the decider. The side was drawn to face the former in the first playoff, a game which they won comfortably on a scoreline of 7-10 to 5-4, thereby advancing to face Geevagh. This game was a much tighter affair between two evenly matched sides but our girls persevered and emerged victorious by four points to claim that spot in the final in which they will play St. Nathy’s. Details of this fixture will be available locally. Good Luck to all involved. Our Gaelic for Mothers and Others group was one of twenty six teams which participated in the Connacht Blitz recently. The team played three games with The Neale, Tuam/Cortoom and Kilglass Gaels providing the opposition, and victory was achieved in all three games and the whole event proved to be most enjoyable. The players who travelled on the day were: L. Harte/Gilroy, G.Watters, A.Toolan, I.McNulty, S.Dunne, J.McAndrew, A.Griffin, S.Tempany, J.Scott, K.Henry, P.Hargadon. The team also travelled to Crossmolina to play the local side and wre treated to refreshments after the game by their hosts. Training continues every Monday and Thursday and new members are always welcome. Well done to the following players on winning the U-12 “A” League plate recently: S. O'Connell, R. McAndrew, M. O'Connell, E.Scott, S.Gillespie, R. Cormack, A. O'Connell, J. Murray, C. Burns, A. Broderick, A. Donlon, A. Rowlette, M. Walsh, L. O'Brien, S.Burns, M. Scott, K. Walsh, E. Tempany, L. Kilrehill. Congratulations and best wishes for the future to club player Deborah Kelly and Daniel O’Hara who were married in Templeboy Church on Saturday last.